Every donation helps a family help themselves. 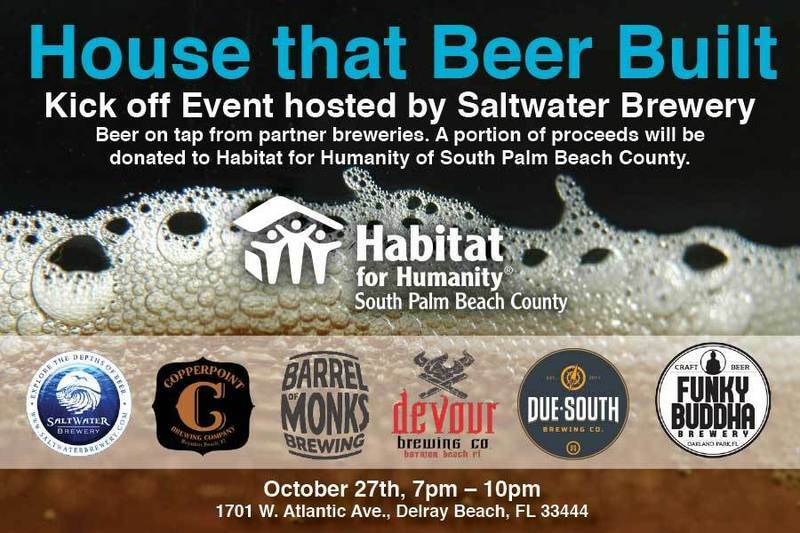 House that Beer Built is a fundraising and volunteering initiative between 6 craft breweries and Habitat for Humanity of South Palm Beach County. The goal is to celebrate this collaborative brewing environment and shared community commitment to raise the walls on a new home for a deserving and hardworking family in South Palm Beach County. Throughout the duration of the build, there will be monthly fundraising and volunteer events in partnership with local breweries and restaurants that benefit the construction of the Singletary home in Boynton Beach, Florida. Your attendance and support will be crucial to the new project's success. Our goal is to engage the community in raising an additional $3,000 to help make homeownership a reality for the Singletary Family. This is your opportunity to drink beer for a good cause! Can’t make it to the event? Not a problem! Get a coupon for a free pint of beer from each partner brewery (6 in total!) 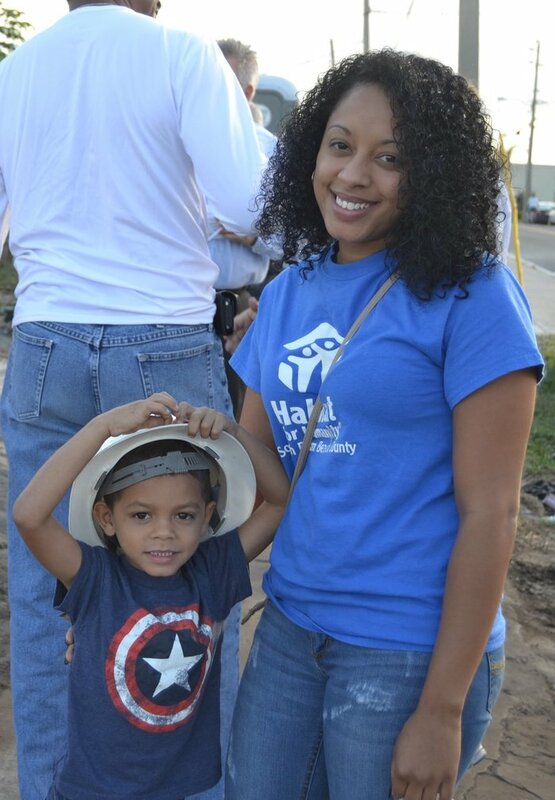 by completing one volunteer shift with Habitat for Humanity of South Palm Beach County. “I’m looking forward of just having the feeling of saying “all this is mine”. I don’t have to move out or have restrictions on what I can do. I can kick off my shoes and jump on the couch and say “all this is mine”. Whitney Singletary was born in Boynton Beach, FL. Whitney’s mom had her when she was 19 years old and separated from Whitney’s biological father two years later. Whitney lived with her mom, step dad and half brother growing up in Boynton Beach. In 10th grade, Whitney met a classmate at Boynton High School who she dated on and off for a few years. When she was 18, Whitney decided to go live with her biological father in Boca Raton and go her first job working at Pier 1 Imports. Two years later, Whitney became pregnant with her boyfriend’s son, Desean. They were both excited about the baby, but her family disagreed. As time went by, the relationship between Whitney and her boyfriend dwindled. They broke up and Whitney made the decision to move on and raise Desean as best as she could. Whitney wanted to become more independent, continue working and create stability for her family. She got a job at Home Depot where she still currently works in the paint department. Whitney currently lives in Lake Worth in a condo with 2 bedrooms and 2 bathrooms. It has enough to fit their needs and provide a bit of comfort but she has had significant issues. The upstairs neighbor’s water heater leaks and has caused water damage in her apartment. Although she has tried painting it, the ceiling continues to peel and bubble due to the water damage. The air conditioning unit is also very old and leaves a damp smell that she can't get out of the apartment. I am looking forward to having friends come over and show my hard work and what I have accomplished.I can have my son’s room decorated how he wants- batman. I can have my own input on what I want my dream house to look like. I am looking forward to having family gatherings and BBQ’s on the weekend. Having people come to MY house and not me always going to theirs.